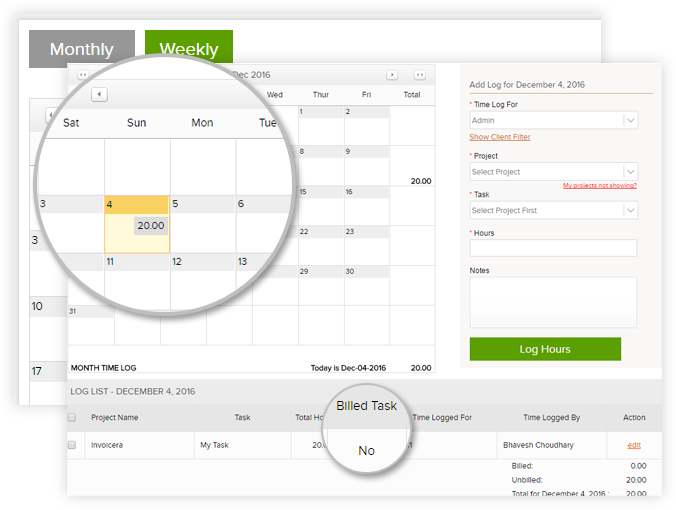 Say goodbye to time tracking worries and keep an accurate log of the hours spent on a client or projects. Manage Billing & Team Productivity With Simplified Time Tracking. Time spent on tasks can be tracked in real time and hours can be logged. Save time with automated time entries. 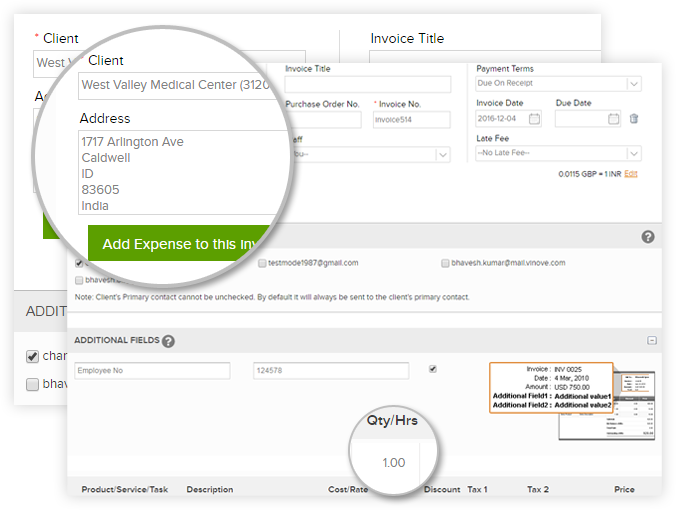 Directly convert billable hours to invoices and mail them to the client. 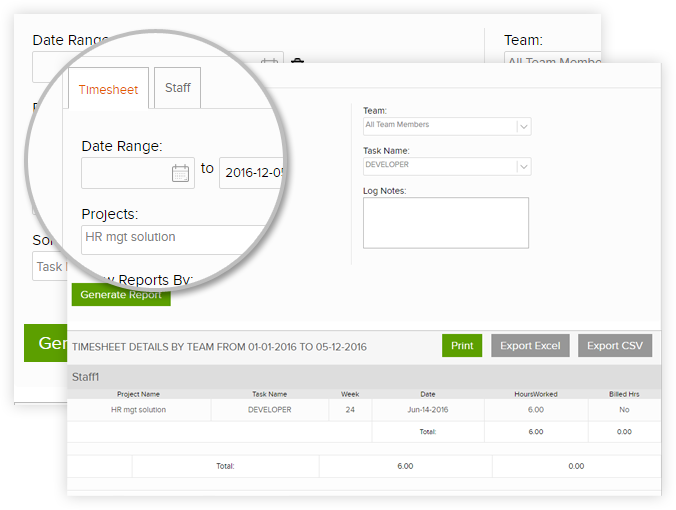 Instantly generate historical time tracking & project reports for a thorough analysis. Reports are helpful in finding out the problem areas and improve productivity. Team wise/ project wise profit loss reports. Productivity benchmarks can be defined and implemented. Detailed time sheets of staff members can be viewed on a weekly & monthly basis. Staff members can thus be helped to manage their time better. Staff productivity can be analysed with time tracking reports. 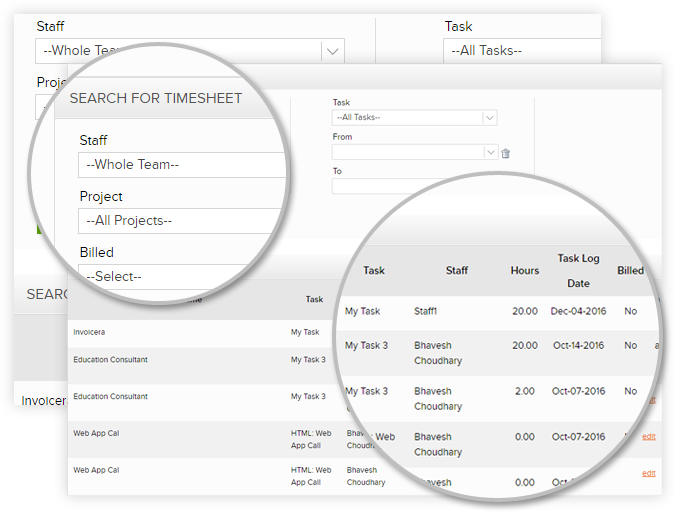 Analyse timesheet reports and share them with clients. Track time and delegate tasks for all your businesses from a single dashboard. Analyse time tracking reports and improve productivity. Time devoted to each task, client or projects can be analysed. 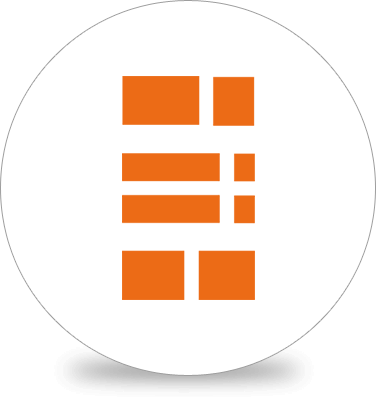 Generate tracked time to invoices. New staff members can be added and hourly rate can be set. Track against clients and projects, time entry notes. Bill for tracked hours accordingly. Integrated expense and time tracking. Effective project and task management. Bill for projects and share work reports. Adding tasks and logging hours are easy in web based time tracking software. The employee time tracking serves both as scheduling and tracking tool. For my contractor business, I needed a solution that replaces an outdated manual invoicing system. Invoicera made it simpler and easier to invoice. Now, I spend less time manually and more time to help clients with their queries. Incredibly intuitive invoicing software. With Invoicera, I'm able to completely manage my consultant business. I really appreciate that invoicing tool is transparent with customer-friendly support. Great tool for automating subscription management. My entire business depends on this software. I'm really pleased with the Invoicera mobile app. Instead of using various other methods of communication, timekeeping, invoicing, reports and keeping tracks of projects and much more. Invoicera app has eliminated all this and carry out these functions in one app. Complete solution for all your invoicing needs. Why does a business need time tracking? Every minute counts when it comes to your business. Imagine how easier your job would be without spreadsheets & billing disputes! Select the right cloud-based time tracking software to collaborate with your business in real time. The free time tracking software makes it possible to track hours and make sure no billable minute goes unlogged. Our innovative & automated time tracking software can help you to get every business minutes billed effectively and efficiently. Invoicera can take away your worries & hassles of time tracking. 4.9 out of 5.0 by 52342 clients for Online Invoicing and Billing Software. Copyright © 2004-2019 Invoicera. All rights reserved. Book a demonstration to learn more about Invoicera and how it can be better fit for your business needs. The e-invoice may often be confused with an online invoice. E-invoice is definitely a much more evolved version of an online invoice. 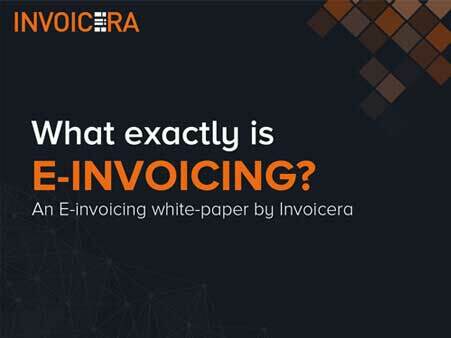 In this E-book we shall understand e-invoicing and all its aspects in detail.